The Dent: Bid now on a corset designed by Tori Amos! Bid now on a corset designed by Tori Amos! UPDATE: The auction ended and the Tori corset sold for $890.00. Thanks to all who bid! Always wanted a one-of-a-kind piece of art created by Tori Amos? Looking for an amazing and unique way to support RAINN? Well then, this is your lucky week! Go to www.fredericks.com to bid on a gorgeous corset designed by Tori Amos! 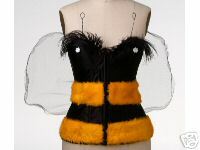 Tori designed a yellow and black striped corset with feathers, which she titles "Honey Bee." The cups have white flowers at their centers becoming eyes, wire antennas on the cups and wire mesh wings on the back creating a very true-to-life bee. Also present is the original notebook and sketch completed by Tori reading "Honey Bee / With Love / Tori Amos / With Hayley West." The corset is hand-made by Frederick's of Hollywood based upon Tori's original design. We hope you will bid early and bid often! 100% of the proceeds from the sale of these unique corsets benefits RAINN. The auction is taking place through ebay and ends Thursday, October 28, 2004 at 6:40PM PDT. Here is a direct link the eBay auction.